Today we're looking at the Dacor Renaissance Epicure 30-inch Freestanding Gas Range Model ER30GSCH/NG. This model is only available in stainless steel. 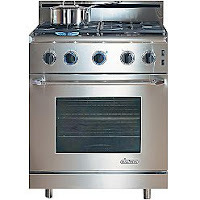 The Dacor ER30GSCH/NG has professional/commercial designing, with a squared-off body, four post legs with ample clearance for easy cleaning, front-mounted controls, a backsplash designed to protect the wall behind it from damage, full stainless steel construction on all exterior surfaces with a jet black porcelain-enameled recessed sealed cooktop, and premium blue control lighting. Two continuous porcelain-coated cast iron grates provide plenty of room for pots and pans. A Simmer-Sear dual-ring burner provides 800-18,000 BTU of cooking power for delicate sauces and searing steaks or wok cooking. There are also two 15,000 BTU burners for general purpose cooking and a 9,500 BTU burner for lower temperature cooking or smaller pots and pans. Perma-Flame technology ensures that burners re-light should they become extinguished while cooking. And, the burners are designed so the flames have minimal contact with the grates to help prevent discoloration and wear. The oven contains hidden 30,000 BTU stainless steel baking burner for even heating. The broiling element is an 18,000 BTU infrared ceramic broiling plate, for professional-level broiling and superior control and evenness. With Dacor's Pure Convection system, a fan, filter, and air baffle provide baking and broiling tasks with even and consistent temperatures inside the oven. You can cook more food at once, faster than normal, without flavor transfers, and with better results than with a conventional oven. The oven's jet black porcelain interior shines with quality, halogen lighting gives you a clear view of your food, and three oven racks provide plenty of options for any baking or roasting needs. For safety, the knobs glow blue to indicate that the burner is active. This range is also equipped with a Sabbath mode. If your kitchen needs a touch of sophistication, you're a heavy-duty home cook, or you just want one of the finest 30-inch gas ranges available, look no further. The Dacor Renaissance Epicure 30-inch Freestanding Gas Range Model ER30GSCH/NG is the range for you.